I’ve acquired an iPad now that the current models have a screen that you can read on for extended periods. I hunted about a bit for a good Twitter app, which seems to be something I do pretty regularly no matter what platform, since they all seem to have their share of shortcomings. 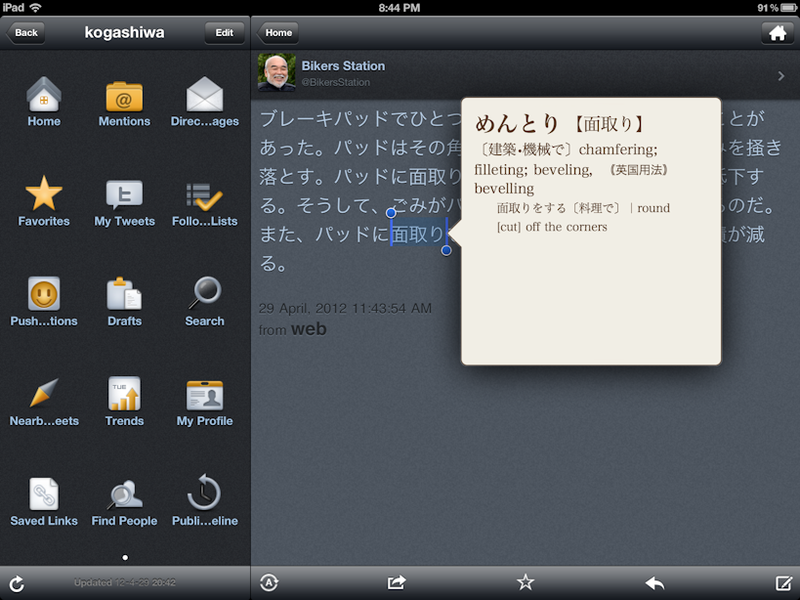 For reading Japanese though, it seems TwitBird is the best solution. This app is in general more “adequate” than “excellent”, but it does have one feature that should be standard in any app but seems actually to be exceedingly rare; and that is that when you view a tweet by itself, it displays it in plain text, and supports the built-in dictionary. No other app I tried lets you select or look up individual words. It’s also localized into Japanese (Niburutech is actually a Japanese company), and of course the built-in dictionary will give you Japanese definitions if you have your device set to Japanese interface. You can also select any portion of the tweet (or the whole thing) and copy it, so then you can switch to your favourite text editor (I like PlainText, saves notes as .txt files and syncs with DropBox) and paste it in for use in MCDs later. If you know of any better apps that also support the dictionary, please post them in the comments! This entry was posted in Learning Tools. Bookmark the permalink. how do you get the japanese/english dictionnary in your first picture ? 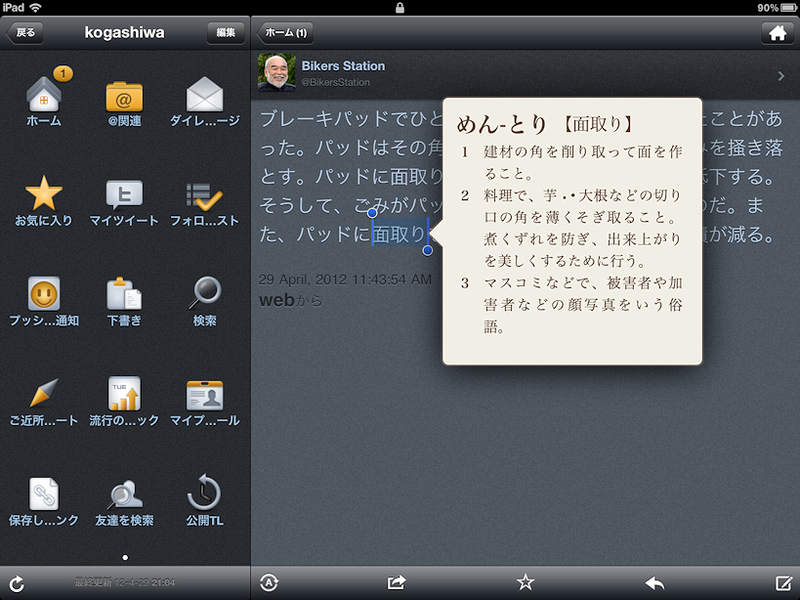 I never try my Ipad in japanese. The app has to support it, but if it does, all you have to do is highlight the word and a “define” option pops up along with the “copy” option. Congratulations on finding an app that can actually do this – I’ve been looking for ages! I was so frustrated when this feature was removed from the official twitter app. Seems like such a simple thing to keep in to utilise the in-built dictionary. Shame Twitbird is such a sub-standard twitter app.